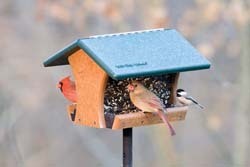 It all started with the WBU Classic Bird Feeder. In 1990, Jim Carpenter, founder, president and CEO of Wild Birds Unlimited, set out to create the perfect wooden bird feeder. He designed a stylish, durable and easily maintainable feeder that offered the one feature found in no other feeder - the ability to see bird feeding better. That day, the Wild Birds Unlimited Classic Hopper Feeder was born. Its design has kept its integrity for over 23 years, has been awarded a coveted 3D Design Patent and has become the symbol for the Wild Birds Unlimited franchise. The unique design of our Classic has been the standard for all of our wooden and recycled plastic line of hopper feeders. 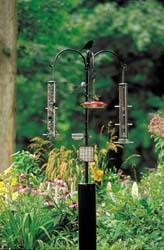 The curved design allows you to see birds feeding on both sides at the same time. Other features include perch drains that allow seed to drop out of the feeder for ground-feeding birds to eat and angled perches that allow empty seed hulls to be blown away by the wind, making the feeder self-cleaning. Our patented Advanced Pole System (APS) was introduced in 1999 as a revolutionary concept and the foundation for successfully attracting birds to your backyard. Comprised of interchangeable hardware pieces, the APS lets you select the setup that best suits the habitat in your own backyard and the birds you want to attract. Its modular design allows you to add or subtract bird feeders, bird houses and other bird feeding accessories, giving you the ability to create and customize your bird feeding station with over 3,000 combinations — it is all up to you! How Does It Work? It’s easy! Just insert a screwdriver into the hole at the middle of the 4-foot Base Pole and twist it into the ground using the convenient corkscrew auger connected at the bottom of the pole. Next slide the Stabilizer onto the Base Pole and push into the ground so it “stays straight and looks great!” Plus, it is lawnmower-friendly. APS is finished with a durable powder coating that gives a depth to the look and allows clinging birds like woodpeckers to cling to the vertical pole allowing longer looks at the birds. Get Creative! Create your own unique setup with the innovative Advanced Pole System.